References don't exist in a vacuum. When you are writing, insert temporary citations into your manuscripts, and when ready scan them to generate finished versions ready for submission or publication, with full in-text citations, footnotes, and bibliographies that meet the most exacting requirements. Even create subject bibliographies on-the-fly. Bookends can also scan manuscripts written with Apple Pages '08 and '09, Nisus Writer Express or Pro, OpenOffice 3.x, or documents saved in RTF format by any word processor. Plug-ins let you access the power of Bookends from within Microsoft Word (including Word 2008). 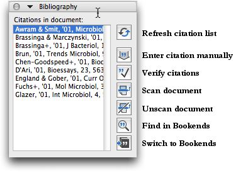 The word processor Mellel is "Bookends-aware", with special features such as scanned and unscanned citation views, background citation verification, and reference syncing between collaborators.